Like other VXR versions in Vauxhall's line-up, the Astra VXR has been designed to combine dramatic looks with exceptional performance and handling. All this is motivated by demanding buyers who want usability and good value as well as a hot hatch that's enjoyable to drive. The Astra VXR comes in three-door form only, and while this is a disadvantage compared to rivals available with five doors, the benefit comes in the Astra's appearance. Based on the three-door Sport Hatch it has coupe-like styling, thanks to the wedged profile and high tail. A substantial bodykit and large alloy wheels as standard add to the visual appeal, making the Astra VXR unmistakable. Some might find its looks too aggressive, but many will appreciate its distinctiveness. Inside, the VXR version benefits from further improvements over the standard Astra. Recaro sports seats, a chunky three-spoke leather steering wheel and different instrument graphics are all standard, while leather and carbon fibre-effect trim gives a more upmarket feel. Otherwise the interior is carried over from the mainstream hatchback, including features such as the electronic indicator stalks. 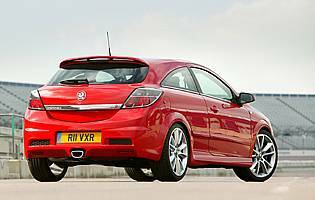 Mechanically the VXR uses a 2.0-litre turbocharged engine, which is also found in SRi versions of the regular Astra. 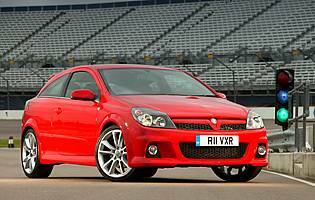 In the VXR it is modified to increase power and torque output for greater performance. It is also matched to a six-speed manual transmission, designed to maximise the engine output. 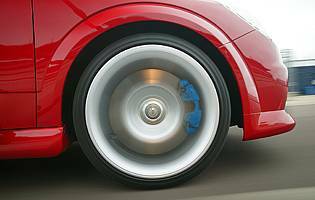 Further mechanical changes include uprated brakes, with larger diameter discs with blue painted callipers. 18-inch alloy wheels are also fitted as standard. The Astra VXR certainly has all the right ingredients to make an excellent hot hatch, and when the driver is in the mood it can deliver a great deal of entertainment. The downside to this enthusiastic streak is that it can be a demanding car to drive quickly, due to the torque steer and sharp turbocharger response. Some drivers will relish this aspect of the Astra's personality, while others may prefer something more measured in its responses. The Astra VXR manages to capture the feel and nature of a hot hatch of an older generation while delivering the refinement and usability of a modern hatchback. Some buyers may find it is too biased towards performance, but anyone looking for a genuine performance car in a family-sized package should give the VXR serious consideration. The initial purchase price for the Astra VXR is appealing, especially considering the amount of performance and standard equipment on offer. Fuel economy is acceptable when driven with restraint, although the high insurance grouping will make it expensive for younger drivers. Running costs will also be broadly in line with more humble Astra models, thanks to identical service intervals. With the three-door Sport Hatch shape, the interior of the Astra VXR feels more cramped than the five-door, although this is mostly due to the reduced glass area. Accommodation for front and rear passengers is more than acceptable for a car of this size, and the boot also provides ample luggage space. It also retains the folding rear seats of the regular models, therefore it remains just as practical as its more humble siblings. Standard specification on the VXR includes a chunky three-spoke steering wheel, which is nice to use, and a special gearknob for the six-speed gearbox. While this is pleasing to hold, the design may not be to all tastes. The VXR also gains special instrument graphics, which are pleasing to the eye as well as informative. The steering wheel controls are quite clever, and can be used to navigate through the menu systems, although they are placed where the palm of the hand naturally rests which can be distracting. The Recaro front seats provide excellent support, and are very comfortable even on a long journey. Driven with restraint the Astra VXR provides acceptable comfort levels, with road and wind noise remaining well contained. On rougher roads the stiff suspension can cause disturbance in the cabin, but otherwise the Astra is comfortable enough to use every day. A car as desirable as the VXR can easily attract the wrong kind of attention, but features such as remote central locking and an ultrasonic alarm should deter potential thieves. With an improved braking system and extra grip from the lowered suspension and bigger tyres, the Astra VXR should be even better equipped to avoid an accident than the standard model. ESP is also fitted as standard. Passive safety features also include six airbags, seat-belt tensioners and clever features such as automatic unlocking and hazard light activation in the event of an airbag being triggered. Keen drivers will relish the Astra's enthusiasm, thanks to its lively and powerful engine combined with good brakes and accurate steering. The suspension is clearly biased towards sporty handling, with very little roll in corners and lots of grip on offer. The downside is a firm ride, which is perfectly acceptable on smoother roads, but when the road surface deteriorates it can become uncomfortable for some passengers. However, drivers buying a car of this nature should be prepared to sacrifice some ride comfort for the subsequent improvement in handling. The other result of the Astra's powerful engine is torque steer when accelerating hard. With the ESP system switched on, it can cut in repeatedly to prevent wheelspin, especially on damp surfaces. 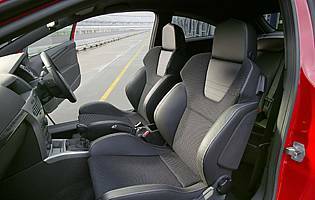 While the VXR may be just as capable as regular Astras at carrying a family, the smaller glass area does make the rear seat area quite dark, and the restricted view out may be an issue for family members in the rear seats. Young and enthusiastic drivers may well be tempted by the Astra VXR as a first car, but it is likely that it high insurance group rating would make it too expensive. Otherwise the VXR would not present significant problems to an inexperienced driver, except the level of performance available. With a dramatic bodykit and large alloy wheels, the Astra VXR projects a strong, sporty image. This continues on the inside, and it has enough impact to challenge established rivals in the hot hatch sector. Its image is such that it will have strong appeal to buyers looking for an exciting and sporty performance car. In absolute terms the quality of the Astra is good, with materials of a respectable quality, although it does not feel as high quality as some of its rivals. A three-door only bodyshape makes access difficult for rear seat passengers, particularly as the front seats are quite bulky. The big doors help access to the front, although the steeply-raked front pillar and low suspension does require passengers to bend down on entry. Accessibility to the boot is good, apart from the intrusion of the rear lights. Standard fitment to the Astra VXR is a combined CD and radio tuner, with the useful addition of MP3 compatibility. The screen display is informative and the steering wheel controls make it easy to operate. The sound quality is also good. The dominating interior colour is black on the Astra VXR, and while this may make some passengers feel a little claustrophobic, it does blend well with the carbon fibre and aluminium-effect trim elsewhere in the cabin. The chunky sports seats are finished in smart leather and cloth trim, with flashes of chrome on the interior door handles and the gearknob. The trim itself is mostly identical to that found in the regular Astra. Although the Astra VXR is a relatively easy car to drive, the restricted rear view can make it a little difficult to park. This is compounded by the low profile tyres, which makes it easy to damage the alloy wheels on the kerb. Emergency tyre inflation kit supplied instead of spare wheel. Range comprises of six petrol (1.4-litre 90bhp, 1.6-litre 105bhp, 1.8-litre 125bhp, 2.0-litre turbo 170bhp and 237bhp) and five diesel engines (1.3-litre 89bhp, 1.7-litre 80bhp and 100bhp, 1.9-litre 120bhp and 150bhp). Five-speed manual gearboxes are standard on most models, with six-speed manuals on the 2.0-litre 237bhp petrol and 1.9-litre 150bhp diesel. The trim levels available are Breeze, Expression, Life, Club, Design, SRi, Elite, VXR.